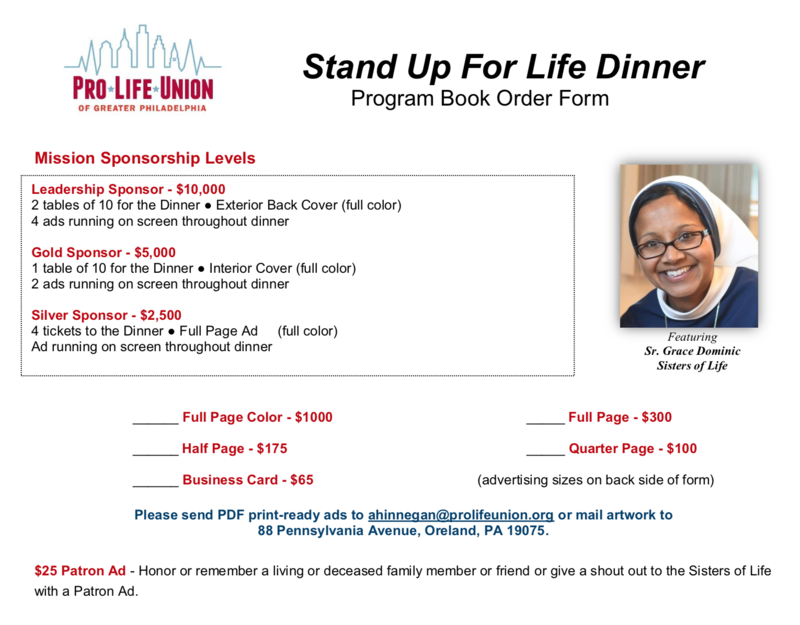 Thank you for your support of the Pro Life Union through your attendance and purchase of ticket(s) to the Stand up for Life Dinner. The estimated value of goods or services (one meal) provided in return for your ticket purchase is $50 per person/ticket. On the night of the Dinner, if you know your table number you do not need to check in at registration. Instead you can enjoy the general recption from 4:30-5:30 and when the doors open proceed directly to your table. We receive a discounted parking rate for the evening. When you arrive you may pay in advance for your parking upstairs in the foyer. Again, Baby Bottles for Life will be placed on the tables waiting to be filled with your change, cash and checks. When completing your purchase, please click "Write a comment" and enter name(s) of guests attending, along with any other important information you would like us to know.